We know our volunteer work is fun and rewarding, but we also realize that being ready to plant trees at 9:00AM on a Saturday morning can be tough – especially if it’s cold or rainy (or in the case of this weekend, snowing!). Luckily for our volunteers, for the fourth year in a row Starbucks is a contributing sponsor for the 2011 fall Community Tree Planting season! 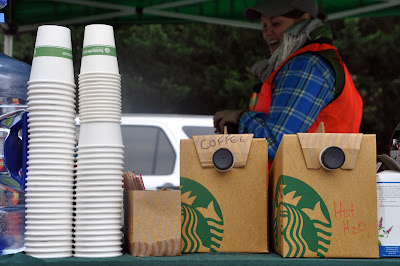 At most tree planting events, you’ll find Starbucks coffee at the Casey Trees registration table. Volunteers can help themselves to a hot cup of joe to wake up, stay warm and get moving. Starbucks’ generosity provides a reminder of what goes into each Casey Trees planting event. Our grassroots approach to beautifying this city means that both our applicants, and Casey Trees, rely heavily on our volunteers for much of our labor needs in planting trees. In turn, Casey Trees provides groups with the tools, training, technical assistance, and of course the trees, at no cost to them. In order to continue the success of our Community Tree Planting program, support like this from our neighborhood partners and friends is invaluable. To learn how you can help out, visit our donation page to make a financial or in-kind contribution for an upcoming tree planting. Or, as always, you can get involved by volunteering and lending a hand at one of our many events. The bottom line is, whether you’re one of the world’s biggest coffee shops, or just one individual, there is no shortage of ways in which you can help support us in restoring the tree canopy of our Nation’s Capital.